ORIGINALLY KNOWN AS THE PORTHYWAEN IRON RAILWAY. The Montgomeryshire Canal eastern section and the Ellesmere Canal met at "Porthywaen Lime Rocks", both being opened in 1797. To develop traffic, the Montgomeryshire Canal Company Act of 1794 authorised "That in case the Proprietor...of any Manor...containing...any quarries of Limestone or other stone...lying within a distance of Three Miles from the said Canal...shall find it expedient or necessary to make any Rail Way or Road for the purpose of conveying his...Limestone ..then it shall be lawful for him to make such Rail Way, Road, or Bridges, and Wharf". This tramway was one built under this clause by the Earl of Powys, from Crickheath Wharf (GR 32923234) generally westwards to the limestone quarries at Whitehaven. The opening date is unknown, Baxter has c1794, but this was before the canal was opened. W.Davies "General View of the Agriculture of North Wales," published in 1810 refers to the tramway and Christiansen & Miller have 1820 from Crickheath Wharf to Llynclys and on to Porthywaen about 1826. 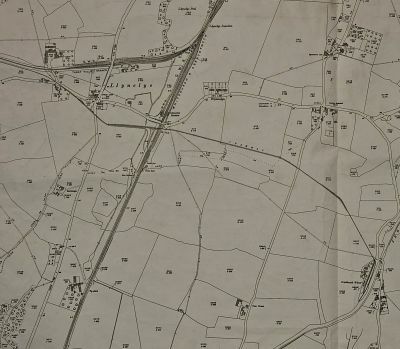 The line is shown on the 2" Ordnance Surveyors Drawings of 1827, east of the Oswestry to Welshpool turnpike and the 1830-1831 surveyed section west of the turnpike. Beginning at 'Crick Heath Wharf' on the Ellesmere Canal the route ran generally westwards to cross the Oswestry to Welshpool turnpike (A483) on the level and then the Llynclys to Porthywaen road (B4396) also on the level, continuing west to the Limestone Quarries where it split into two short branches. The line is next shown on the 1" OS map published on the 14th June 1837 following the same route to terminate at 'White Haven' at GR 32723242 about one and a half miles from Crickheath. The Oswestry & Newtown Railway received its Act on the 26th June 1855 and was opened from Oswestry to Pool Quay on the 1st May 1860. As the line crossed the tramway at Llynclys, a bridge was built to carry the tramway across at GR 32843240 under a clause in the Act ordering the company not to interfere with the gradient of the tramway. The O & NR received a further Act for a short branch from Llynlys Junction to the quarries at Porthywaen adjacent to Whitehaven on the 3rd July 1860 and the Act prohibited the company from altering or interfering with the line or level of the tramway. The line opned on the 1st May 1861, removing some traffic from the tramway which however remained in use to carry stone and lime for distribution by canal. The Porthywaen branch ran alongside but to the north of the western part of the tramway. In 1862 at the suggestion of the O&NR, two public sidings were to be provided on their Porthywaen branch for use by the quarries lessees in substitution for the existing siding on the line at Llynclys, where a short tramway branch ran to an exchange siding, was accepted on the 25th June. The implication of this is that the branch was initially used exclusively by Thomas Savin and other lessees had to move stone and lime down the tramway for transshipment to the O&NR. 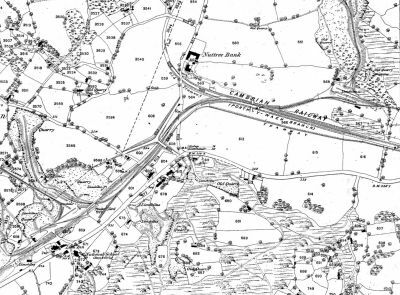 It is unclear if the interchange siding at Llynclys was built, the earthworks are shown on the 1875 OS map, so perhaps it was, but its life would have been very short, one or two years. The 1875 OS map whows the same basic tramway route as 1837, detailing the single siding that reversed to reach the wharf at Crickheath, the bridge across the Cambrian, and the unused earthworks of the short interchange siding at Llynclys. At Whitehaven the tramway served a timber yard and then curved to run beneath the Porthywaen Branch before running through a loop to terminate further north than earlier at the end of an enlarged Whitehaven Quarry at GR 32683244. Leases located in Powysland Refernce Library, Welshpool, by Davies filed under "Savin & Co, leases" indicate that Thomas Savin leased Porthywaen Quarry in 1881 and 1887 and the tramway is described in the leases. The said Earl (of Powys) was the owner of an Iron Tramway which for many years past had been used for conveying limestone from the Porthywaen Lime Rocks to the Ellesmere Canal at a place called Crickheath Wharf... the said Tramway was not wholly carried over lands of the said Earl but passed in part over lands belonging to other persons and a yearly payment was made by the said Earl to each of them in respect of the loss of land and trespass occasioned thereby..." A letter dated the 23rd January 1897 from Powys Castle Estate Office to H.Le Neve Foster (a director of the Porthywaen Lime Co Ltd, then working the quarries) headed Crickheath Tramway states "I am as anxious as you are to get this matter settled. 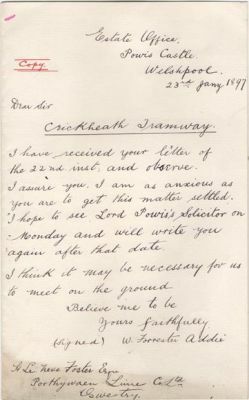 I hope to see Lord Powys's Solicitor on Monday..." A second letter dated 16th February 1897 from H. Le Neve Foster to E.D Nicholson, the secretary and general manager of the Porthywaen Lime Co Ltd who was then working the Porthywaen quarries includes "How is the Crickheath Railway doing? I presume you are working this now and by this means will be able to clear more stone at Pear Tree (Quarry) and at the same time push on with Nut Tree (presumably another quarry) " The implication is that the "matter" was the purchase or lease of the Crickheath Tramway from the Estate but this is not yet confirmed. 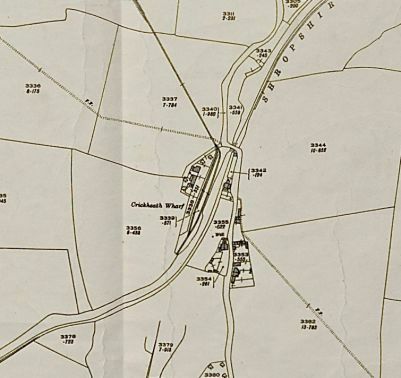 The 1901 OS map shows the siding at Crickheath Wharf had been converted into a loop whilst at Whitehaven the line crossed a standard guage siding on the level before continuing beneath the Porthywaen Branch to a crusher in Whitehaven Quarry. The Tanat Valley Light Railway , authorised on the 4th June 1899 and opened on the 5th January 1904, branched from the Porthywaen Branch and the initial portion of the branch was then upgraded for passenger use. Signals were provided to protect the tramway crossing under the control of the signalman at Porthywaen Signal Box with an additional signal to control the mixed guage track to Whitehaven crusher.. The 1926 OS map shows these changes at Whitehaven with the tramway crossing the Tanat Valley line on the level before running as a three rail line behind Porthywaen Signal Box , beneath the Porthywaen line and terminating at a modified crusher in Whitehaven Quarry. The line later closed, probably following the bursting of a canal culvert over the Morda Brook about 1932, following which the canal was not restored. The track was lifted in 1939. 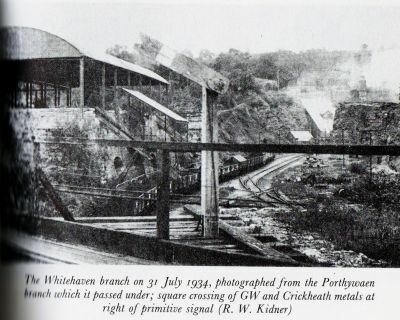 In 1932 the Steetley Lime & Basic Co took over the quarry and the Porthywaen signal box was reduced to a ground frame probably in the early 1930's, both perhaps indicating the demise of the tramway. A photograph of Whitehaven quarry dated the 31st July 1934 certainly appears to show the tramway in the quarry, out of use and overgrown. The Davies paper read in 1945 notes "has been disued for some years, but the embankment across the field from the Oswestry -Welshpool road to the railway near Llynclys Station can be plainly seen". Today (2015) the wharf at Crickheath alongside the partially filled canal lies on private land, the stoneabutments of the bridge over the O&NR at Llynclys plus a short length of the tramway embankment westwards and the girder bridge (cast Brymbo 1861) carrying the road over the tramway as it approached Whitehaven, constructed by the Oswestry & Newtown Railway, remain. what may be the remains of the crossing gate guarding the tramway crossing the access road to Llynclys goods yard are buried in the hedge..
1820 First railroad built to serve the Porthywaen quarries known as Porthywaen Iron Rail Way built under powers contained in the Montgomeryshire Canal Act of 1794 the gauge 3ft .The line ran from the canal wharf at Crickheath to Porthywaen and was approx 2 and half miles long. 1934 photo showing Pear Tree Quarry with the Cambrian Railway leaving the quarry together with the Crickheath Tramway. 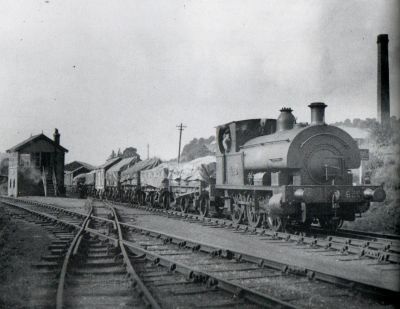 Note the limekilns to the left of the railway trucks. This photo shows the Crickheath Tramway inside the Cambrian Railway line as it enters the Pear Tree Quarry. Opposite view of the Crickheath Tramway leaving Pear Tree Quarry and crossing the Tanat Valley line before going under the road bridge . 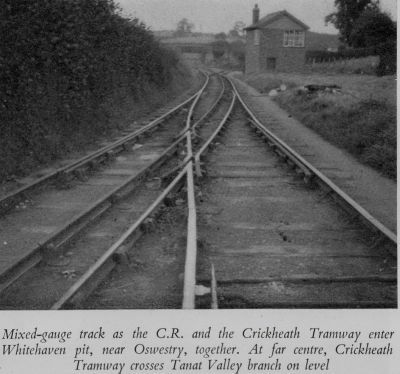 Photo showing the seperate bridge taking the road over the Cambrian Railway and the Crickheath Tramway. Date on the bridge over the Crickheath Tramway ' Brymbo 1861. The 2 bridges over the Cambrian Railway line and the Tramway line would have been put in when the railway first came to the Limestone quarry at Porthywaen. 1926 map showing the Crickheath Tramway terminus. The below photo was taken at the very end of the terminus. Early 1900 photo of one of the horse drawn trucks at The Crickheath Wharf. 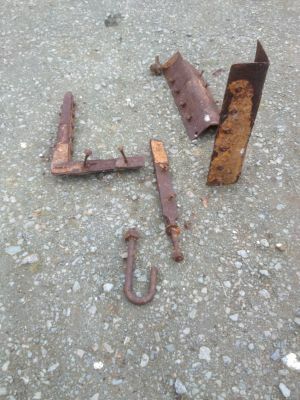 The remains of one of the trucks, namely the metal sides and plates, including the bolts and nuts, but not the wheels, have been recovered from the bed of the canal. 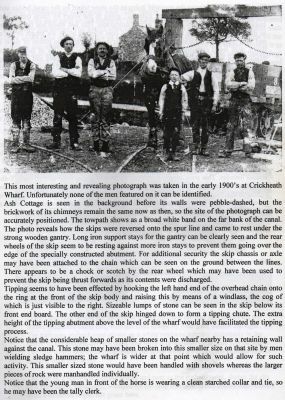 It is hoped to organise a metal detector to attempt to find the wheels in the mud and then be able to construct a replica of the truck to display either on the Wharf or on the bridge at Llynclys. Remains of the tramway truck found recently in the canal at Crickheath Wharf. 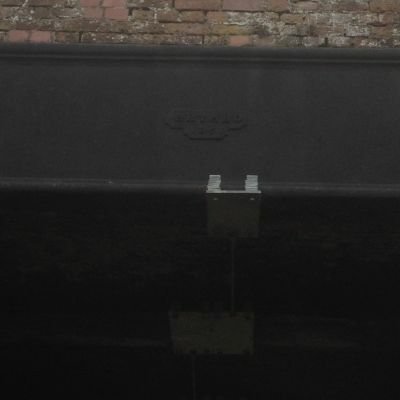 Note the nuts and bolts still in the metal work giving the sizes of the planks of wood which can be clearly seen in the above photo. A metal clamp found in the garden of Pear Tree Cottage at Crickheath which was the terminus of the Crickheath Tramway. Two of the clamps together with other artifacts have recently been found in the garden when we organised a search with metal detectors. Also found was part of the original track still buried which is the track in the above photo that the young boy is standing in. Remains of the original bridge that carried the Crickheath tramway across the Cambrian Railway at Llynclys. On digging into the trackbed of the bridge, the original rails of the tramway have been discovered and the guage has been found to be 3 feet, not 2ft 6inches as originally thought. View across the bridge Original tramway rails have been found still in the bed of this part of the bridge, proving that the guage of the tramway was 3 feet. Retirement certificate of Mr Samuel Davies who worked at Llynclys Quarry for sixty years, and was one of the men who took the laden trucks down the Crickheath tramway (2 trucks at a time - 4 tons of limestone in each) . To slow the trucks down on the continual gradient he would push a metal bar through the spokes of the wheels and the trucks would slide to a halt. A horse would accompany them to the wharf and then pull the empty trucks back up to the quarry.